This past June, I was invited to speak at a symposium on TBI/PTSD in Warsaw, Poland. As a Physician Assistant in functional medicine, I was invited by the Friends of GROM (editor’s note: GROM is Poland’s elite special operations force) to speak on hormone replacement in males with TBI/PTSD. As another healthcare provider spoke, I heard him call TBI/PTSD “the signature injury of the War on Terror.” Certainly, the narrative pushed by the media and entertainment industry is that everyone who has donned a uniform suffers from some form of post traumatic stress. I frequently meet people who are openly skeptical about my claim that I do not suffer from PTSD, despite the fact that statistically the vast majority of Post-9/11 veterans don’t. I am part owner of a medical practice that sees clients ranging from professional athletes, to special operators, to civilians hoping to achieve and maintain their peak levels of performance and wellness. In my experience with active duty and veteran patients, I find hormone imbalance to be as common and perhaps even a more common invisible injury than TBI/PTSD. 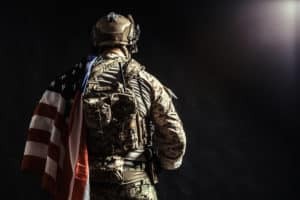 1 in 4 American males over the age of 30 already suffer from low testosterone, but I see a higher rate of incidence, often in younger patients, in my military and veteran case load. It’s easy to believe the cliche about the tough-guy soldier with too much testosterone, but the reality is often the opposite. The “signature injury” of the War on Terror might be Low-T, not PTSD. The patients I treat are often subjected to life in a stressful environment for prolonged periods of time. When your body remains in a sympathetic (fight or flight) response instead of resetting back to parasympathetic (rest and digest), it wreaks havoc on your hormones in the long term. The short term spike in cortisol that occurs when a stressor is introduced is good in the immediacy – it keeps you alert and helps you survive a dangerous situation. But when your cortisol remains elevated for weeks, months, or years (for example deploying multiple times over several years), it’s going to have detrimental effects on your health. In my patient population, I see a proliferation of young and middle aged men who experience an abundance of stress in their military careers with lower than normal testosterone. It’s especially concerning to me as a healthcare provider, because low testosterone increases the risk of heart disease, cancer, weight gain, metabolic syndrome, decreased muscle mass, fatigue, and a host of other issues. These guys don’t foresee the impact of stress on their bodies and they’re paying for it hormonally. Furthermore, many of my patients don’t understand the true definition of “stress.” It’s not just a feeling. Poor diet can be stressful on your body, as can lack of exercise, or even over exercising. Not sleeping enough is a huge stressor. I ask my patients what stressors they have in their lives and they tell me, “wife, kids, job, etc,” but they’re not even considering what they’re eating, how little sleep they’re getting, or what physical demands they’re placing on their bodies. Social media culture doesn’t help, either. I’ve seen guys take advice from accounts that imply sleep is a crutch, that lifting more is better, that they can will themselves to hardness. Some things, however, cannot be changed, and some basic tenets of physiology will always remain. You must sleep. If you over train, you will break down. Stress will affect your hormones. I work with one other provider, Dr. David LeMay, but I hope more veterans become aware of the need to check hormones. I am fortunate at my practice not to be restricted by insurance guidelines, unlike many physicians, however, who feel bound and may not order tests unless a problem is obvious. They also use fairly broad ranges for “normal” levels of hormones. As a patient, it’s your responsibility to educate yourself enough to know when you need a test or to ask a question. It’s your health, so you should be comfortable taking ownership of it. If you’re not comfortable with your provider, find one who works with you.